Snap woody stem ends off asparagus and discard. Cut off asparagus tips about 4 inches long; set aside. Slice asparagus stalks and combine with broth, red pepper, garlic, parsley, and black pepper in saucepan. Cook over medium-high heat 25 minutes, stirring occasionally. 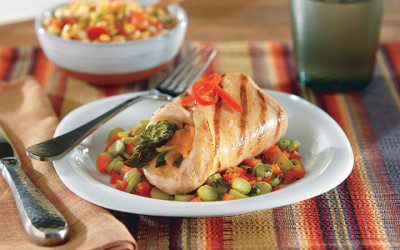 While vegetables cook, place each chicken breast half between plastic wrap, and pound with rolling pin until approximately 1/4 inch thick. Preheat electric indoor grill with lid. Lay 5 asparagus tips across one end of each pounded breast. Top each with 1 tablespoon cheese and fold in half. Place stuffed breasts on grill and cook with lid closed for 6 minutes. Spoon vegetable sauce onto serving plates and top with cooked breast. Garnish with corn relish, if desired. Gelatin Salad: If desired, serve with Gelatin Salad. Mix together 4 cups ready-to-use shredded cabbage, 1 cup mandarin orange segments, and 1/2 cup fat-free vinaigrette in medium bowl. Divide mixture evenly among 4 salad plates. Remove orange gelatin from 4 ready-to-use, sugar-free gelatin dessert cups and slice gelatin with egg slicer or knife. Top each salad with gelatin slices. Garnish each serving with 1/2 tablespoon dried cranberries. Refrigerate until ready to serve. Serving size: 1 stuffed chicken breast. Exchanges per serving: 1 Vegetable, 4 Meat.